U.S. Housing - have we hit bottom yet? This past week, the National Association of Realtors reported that 1) the number of existing single-family home sales declined 6.3% from a year ago while the inventory of homes for sale increased, 2) the number of existing condominium and co-op sales decreased by 4.1%, 3) the median price for single-family homes dropped by 5.9% and 4) condominium prices dropped by 10.1%. The U.S. Commerce Department reported that housing starts during March increased by 7.2% from February, but were down 13.4% from last year. MY TAKE: While year-over-year numbers are declining month-over-month housing trends, while less significant, are improving. Forecasting housing trends have been complicated by: 1) the simulative effect of the Federal home buyer tax credit - in place from early 2009 through May 2010 and 2) the erratic process of foreclosures as various government agencies investigate the practices of many lenders and service providers. In the short term, housing will likely continue to be an economic drag on the recovery as some consumers confront the challenges of foreclosure and "upside-down" mortgages. First quarter earnings season had a rough start this past week. Weekly stock performance for several firms that reported earnings included Alcoa Inc. (US: AA) down 7.8%, Bank of America Corp. (US: BAC) down 4.9%, Charles Schwab Corp. (US: SCHW) up 1.2%, Google Inc. (US: GOOG) down 8.2%, Infosys Technologies Ltd. (India: INFO) down 8.7% and JP Morgan Chase & Co (US: JPM) down 4.2%. This week, firms reporting quarterly results include Apple (US: AAPL), China Mobil Ltd. (Hong Kong: 941), Freeport-McMoRan Copper & Gold, Inc. (US: FCX), General Electric Co. (US: GE), Goldman Sacks Group Inc. (US: GS), Intel Corp. (US: INTC), IBM Corp. (US: IBM), McDonalds’s Corp. (US: MCD), Morgan Stanley (US: MS) and Yum! Brands Inc. (US: YUM). Earnings season is a volatile time for the markets. While several firms had disappointing results, it is a small sample of the hundreds of companies that will share their financial performance during the next few weeks. Positive results and outlooks from companies, along with investor confidence about the future, are critical components for supporting positive market momentum. When U.S. Federal Reserve Chairman Ben Bernanke mentioned the process of quantitative easing (QE2) in late August 2010, most global equity and commodity markets began to move persistently higher. In this environment, equity investors have also benefited from improvements in corporate profits – driven by significant cost cutting. With the QE2 process concluding in June, many investors are wondering, “what happens next?” Additionally, while inflation is muted but rising in the U.S., China and India announced this week that their elevated levels of inflation continue to rise, and some Eurozone policy makers are concerned about this topic as well. MY TAKE: It will take several months or longer before we will understand if the Federal Reserve’s stimulus efforts stabilized the economy or simply provided a short-term fix. The recent global equity momentum may slow as investors assess: 1) the economic and social challenges that can result from rising inflation, 2) the sustainability of corporate profit growth and the 3) the outcome of debates related to the U.S. Federal budget and the debt ceiling – which currently limits government borrowing to $14.3 trillion. 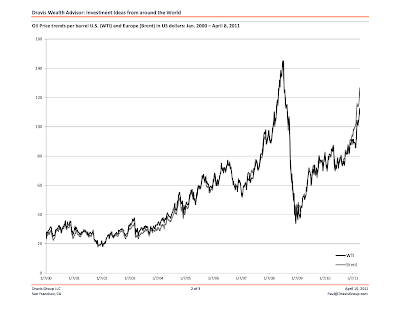 What is driving the price of oil to a 2 ½ year high? On Friday, a barrel of Brent crude oil traded up to $126 in Europe (+34% YTD), while oil in the U.S. traded at $113 a barrel (+23% YTD). Dynamics contributing to the price increase include: 1) increased global demand for oil, 2) damaged oilfields in Libya, 3) uncertainty about elections in Nigeria (a large oil exporter), 3) possible increased gasoline demand during the summer driving season, 4) unresolved U.S. government budget issues and 5) speculative commodity trading activity. MY TAKE: If oil prices remain high, inflation expectations will likely increase, which could result in lowering consumption and slowing the economy. An important indication of the potential economic impact will come from company managements in the coming weeks as they report their earnings. NOTE: Given that U.S. housing prices and hourly wage trends remain weak and the government budget environment remains challenging, investors should consider the potential for both inflation (short term) and deflation (longer term). With inflation increasing globally, will market volatility persist? MY TAKE: Factors driving inflation include: 1) increased global demand for goods and services by developing countries, 2) increased oil prices resulting from conflicts in the Middle East and North Africa, 3) shortages of various agricultural commodities and 4) the effects of the U.S. Federal Reserve’s quantitative easing monetary policy. If inflation continues to increase, investors will have to consider the potential for both lower profit margins and lower demand in their investment decisions.